Click here to be automatically redirected to our page of standard screens and patterns. 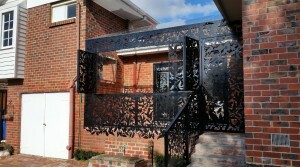 Urban Metalwork’s range of laser-cut privacy screens includes the option to pick from one of our standard designs, alter an existing design or create a new design which is a unique, project-specific piece. We believe flexibility in design scope is important. We can perforate, laser-cut, print and fully customise your metal screen to create a beautifully finished piece, while keeping in mind the needs for privacy. Metal privacy screens are an ideal way to enclose an area due to personal, council or government-imposed regulations, while still having the aesthetic look of a clean, modern, individual screen suited specifically to our client’s project. Privacy screens may be subject to legal, council and town planning requirements, so please consult with your building contractor or architect to make yourself aware of these requirements. Our laser-cut privacy screens can be made for permanent fixing, hinged, lockable and operable. We can also provide optional borders, fixing points, bracketry, folding, welding and installation services for all metal screening projects. All of our screens & patterns at Urban Metalwork are available as a fully operable, hinged, lockable type design. Essentially acting as windows, doors and more, our patterns can be customised to fix directly to SHS / RHS framing. There’s options for basic hinge setups, right through to fully automated systems, upon request. Urban Metalwork also specialises in customised laser-cut garden screens and other decorative metal screens for Geelong properties. Please contact us for more information or to request a custom project.